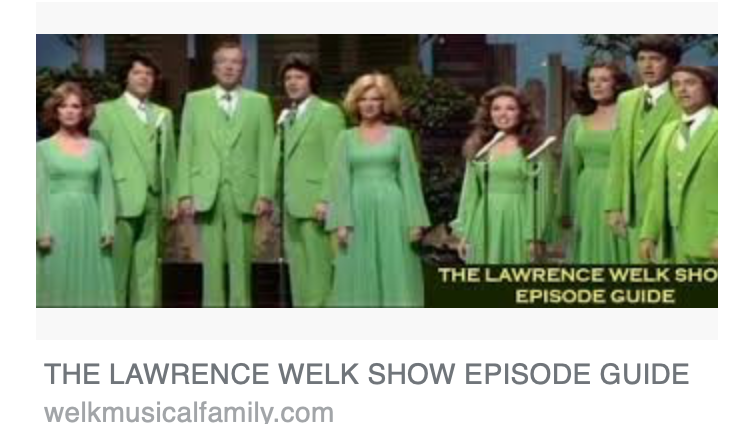 OK, I actually watched the Lawrence Welk Show last night. It was on PBS. I was transfixed and fascinated. People wearing formal jackets - all orange. There are pictures of them all in green, all in yellow. Here is one to prove I did see it. Lawrence Welk is 'classified' as old-fashioned, melodic music. The first episode was July 2 1955, and it was decades later that the final episode aired on April 17, 1982. It continues as a Memories show, with interviews after the show concludes. This week it was with Norma Zimmer. She was his 'Champagne Lady' from 1960 to 1982. Her favourite memory was singing backup on Crosby's famous version of White Christmas. The Washington Post summary: "From his origin in a polka band called L.W. 's Hotsy Totsy Boys, he gradually stapled the choppy syncopation of Wayne King and others onto the warbling, muted saxophones popularized by Guy Lombardo and produced a saccharine, bouncy sound vaguely reminiscent of the turkey trots of World War I." In keeping with this, it isn't surprising to find the retrievals for Lawrence Welk bounced all over the analytical map. There were straight-forward articles on the show and band members who went on to fame, and then strange references, many of which don't seem to show up in the articles. This turned out to be perfect. It is a scientific article excerpt where Lawrence Welk music was used in a synthesis experiment: "The dramatic percussion crescendi from Gustav Mahler’s second symphony have been synthesized using corpora of monkey and animal sound effects, a Muslim Imam chanting the Ko- ran, an hour of vocal music by John Cage, three hours of nostalgic Lawrence Welk, and all four string quartets of Arnold Schoenberg." And further: "A recording of American President George W. Bush has been synthesized by corpora of monkeys, alto saxophone, and Lawrence Welk, and Bach’s Partita for flute". And the next paragraph's first line seems like a fitting conclusion for today: "Specifying a target that is polyphonic understandably leads to trouble". 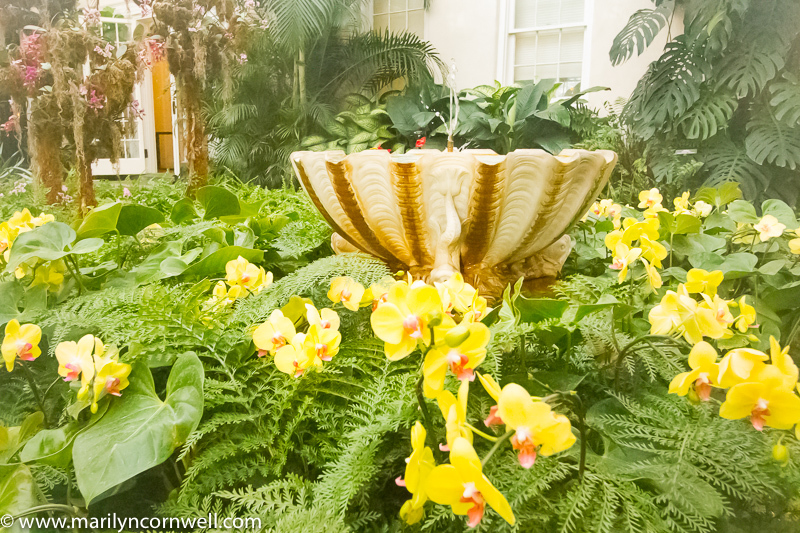 We revisit Longwood's wonderful Orchid Show last January 2018.